Hello. I'm Melinda Wells, author of a current series of "culinary" mysteries: that means murder, with recipes in the back of the book, or, as Berkley Prime Crime put it when they asked me to write this series, "We want cooking, recipes, and murder." The way the editor said "murder" made me think that she might be having revenge fantasies and was seeking a blueprint for the perfect crime. Berkley had just published the 4th book in the first series I was writing for them. 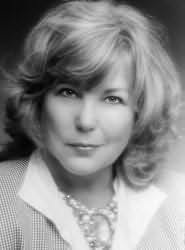 It was set against the background of a popular TV daytime drama and written under my legal name, Linda Palmer. After the 4th book, KISS OF DEATH, came out, my editor called and said, "Even though your heroine, Morgan, can barely make tuna fish salad, because of your 'Aunt Penny' character we suspect that you can cook." I admitted that I liked to cook. Then she offered me the opportunity to write the cooking series. Excited by the new challenge, I agreed and came up with a proposal for new characters and a new location. They liked the ideas and said, "Go. But will you use a pen name so readers won't be confused?" Even though I think readers are very smart, I became Melinda Wells for the new series. I'm accustomed to reinventing myself because I had seven careers before becoming a mystery novelist. They included being a wildlife photographer in Africa, a children's photographer in New York City, writing for TV daytime drama, writing screenplays, assisting a major celebrity with his autobiography, being vice president of a public relations firm, and being a production vice president of TriStar Pictures. There I helped choose the movies we made, and supervised some of them. I also wrote a textbook on screen writing, called HOW TO WRITE IT, HOW TO SELL IT: EVERYTHING A SCREENWRITER NEEDS TO KNOW ABOUT HOLLYWOOD. It was published by Griffin / St. Martin's Press. Then one day a long-time friend reminded me of my assorted careers and asked, "If you could be whatever you really wanted, what would that be?" Without hesitation, I blurted out, "Write mystery novels." He replied, "Then do it." Even though I've loved reading mysteries all of my life, writing them never occurred to me until that moment. That was eight years ago. Now, my 7th novel in the past seven years has just been published: THE PROOF IS IN THE PUDDING." The first two books in this series are KILLER MOUSSE and DEATH TAKES THE CAKE. 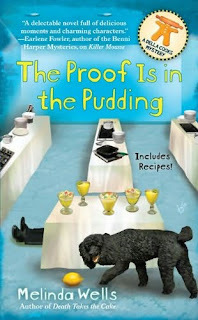 This third one was going to be called APPETITE FOR MURDER, but when I was halfway through writing the manuscript, my editor called and said, "We have a new title for you: THE PROOF IS IN THE PUDDING." I said, "But there's no pudding in the book." She replied, "We love this title -- can't you put in a little pudding?" We didn't have a phone cam so she couldn't see the expression on my face. I kept my voice calm and pleasant as I said something like, "Oh, what an interesting title." Inside my head, I was screaming "Aggghhh!" The irony of having that title imposed on me is that it has resulted in what I believe is a better book than it would have been with the original title and plot. Sometimes good luck comes in a variety of disguises. In addition to being a full time writer now, I also teach novel-writing in the UCLA Extension Writers' Program. It's a great joy because I'm able to share what I've learned over the years with new writers. I've been fortunate in the past to have tremendously talented people teach me. Now I feel blessed to be able to pass that on to others. We never stop learning. At least, I don't ever want to stop learning. For the past several months, ever since I finished writing THE PROOF IS IN THE PUDDING, I've been working on a novel of suspense. Not a "cozy." This book has a male protagonist, and is told in 3rd person. Until now I've been writing female protagonists, told in 1st person. This new book has required me to master new story-telling skills. Every job I've had in my life has given me satisfactions, but I have never been happier than in these last eight years of writing mystery novels. I hope that my books can provide even a little of the entertainment that other writers' mystery novels and thrillers have given me. Anyway, that's my aim. Thank you, Kaye, for inviting me to participate on your terrific blog. I'm honored. I'm a few chapters into Killer Mousse and I'm really enjoying it. Della is a charming heroine, and I can't wait to get back to the book. What a great post, Melinda! 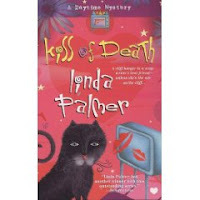 I read all of your first series (as Linda Palmer) which were a wonderful glimpse into "daytime drama" -- I've read KILLER MOUSSE and DEATH TAKES THE CAKE and I am about to start PROOF IS IN THE PUDDING. Your books are a delight - and the recipes are delicious. You are a true inspiration about living the dream! My Linda... Even though time has passed since the horrible day you left us, I miss you as I did on day. Maybe more, as I don't have the comfort of "denial." I never saw this blog, but I can hear your voice. Why couldn't we both have made it through our illness. Like the "sisters" you always said we were, how could it not have been that we would go through that together, too. But you left. And I stayed. I love and miss you. I see you surrounded by Thor and Velvet and Tuffy and Sitka and "my" Tara. I hope you are in a state of bliss.